Campari — The tomato lover’s tomato. 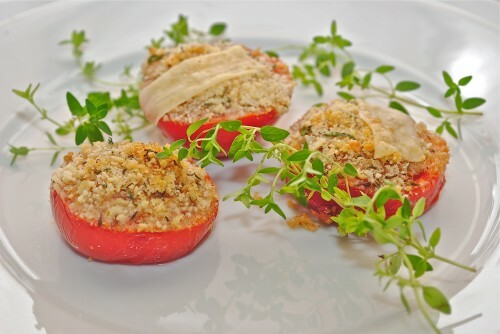 Campari tomatoes are one of my favorite types of tomatoes. They are known for their juiciness and extraordinarily sweet taste and low acidity. They are deep red, bigger than a cherry tomato and so cute to boot. As baby bear said, Not too big, not to little, but just right. 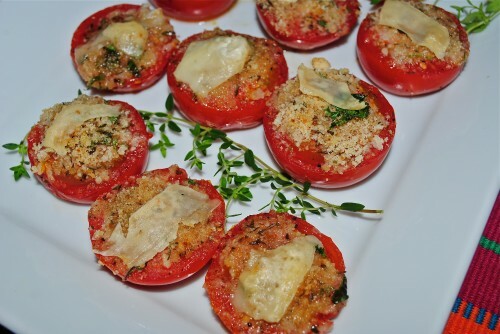 Brunch for my daughter’s birthday on Memorial day consisted of ham, bacon and mushroom quiche, tiny cinnamon rolls, these Baked Parmesan Tomatoes, and some pork belly that was fried up by my husband and of course a bunch of mimosas. 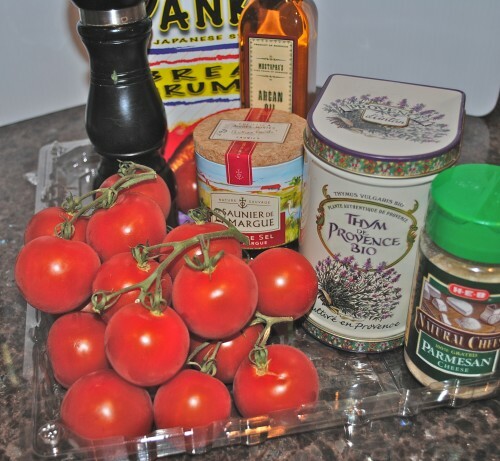 These tomatoes are great to add into any menu. I’ve never been accused of not having enough food but I like to cook and I’m not force feeding anyone. Guest can always pick and choose what they want to eat with no retribution from me not even a hurt feeling or two. It does take me awhile to get over failures. I tend to dwell on something for days (don’t know why) if it doesn’t turn out like I expected. I think I am far, far from a perfectionist but when someone doesn’t like a recipe I know I should have tried it before serving the dish. I feel like if I read a recipe and know the ingredients the end results will be good. Anyone that knows me is aware that I’m not a taster. Never tasted raw cookie dough, can you believe that? All the years of catering did not change that. Now if I was making something chocolate I would probably taste it (after it is cooked, of course) but I guess I feel like if I like the ingredients then I don’t need to be picking on it the whole time taste testing it. 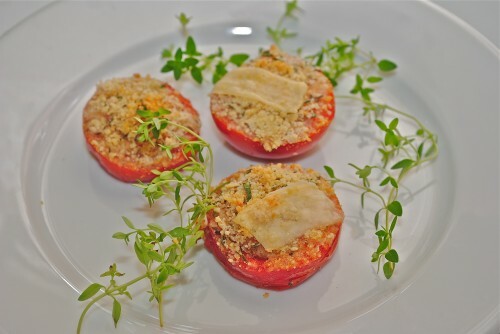 Sometimes I do not hit the nail on the head with a recipe and it may need to be tweaked at another time but most of the time I think I do pretty well without sticking my fingers in the pot. 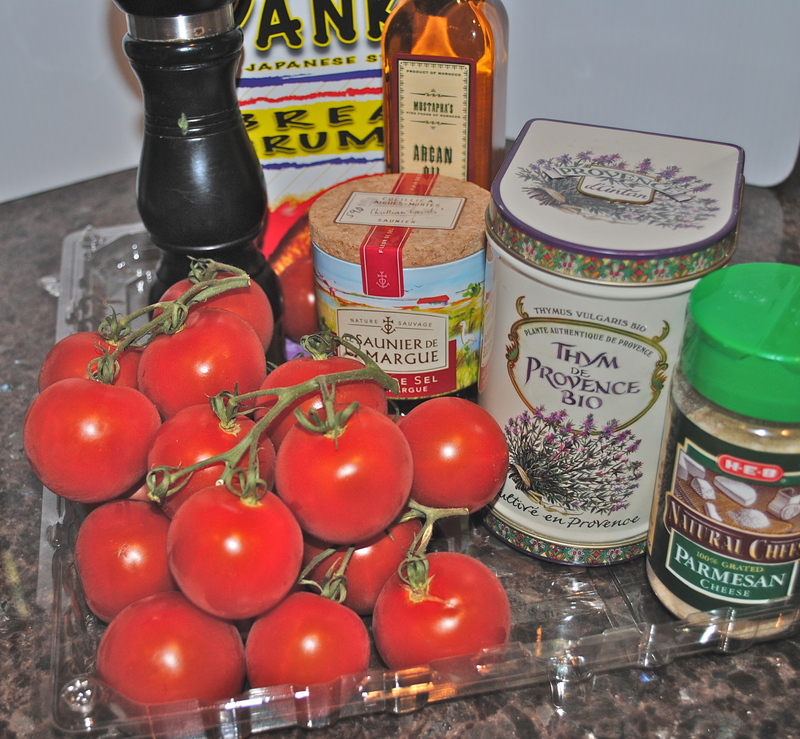 Beautiful tomatoes and my thyme from France. Cut side up and ready for topping. 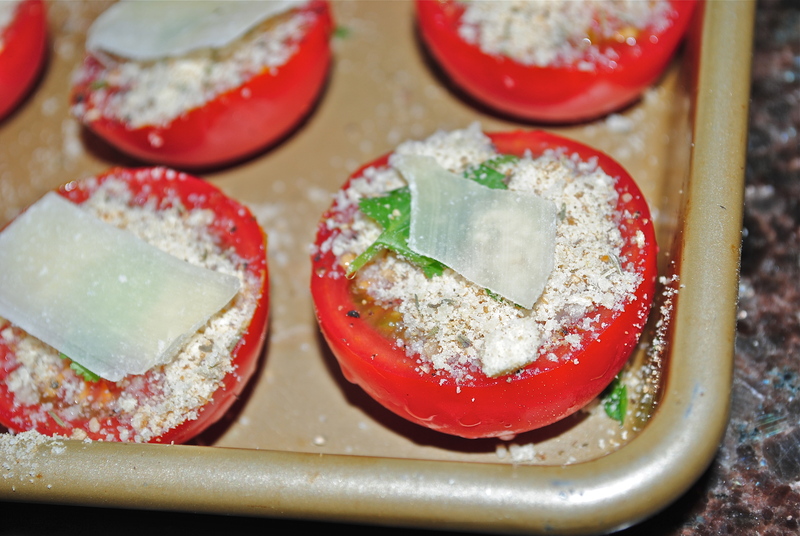 Topped with the crumb mixture and a little shaved Parmesan cheese. Wash and dry the tomatoes and cut in half, cross-wise. 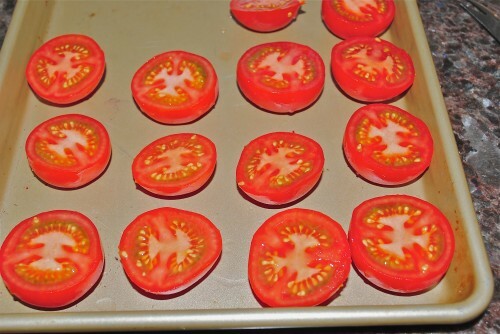 Place tomatoes cut-side up on a rimmed baking sheet. 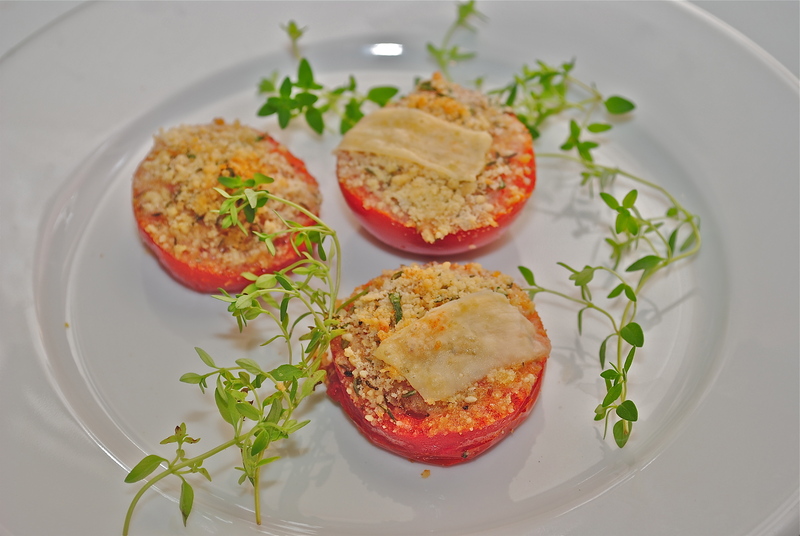 Mix the grated parmesan, thyme, bread crumbs, salt and pepper together in small bowl. Sprinkle this mixture on tomato tops, drizzle with olive oil and top with the shaved Parmesan (this is optional). Bake for about 10-15 minutes until nice and brown.